Does Melbourne Have Good Customer Service? It's part of the holy trinity of the consumer world, but when it comes to the service experience, many Melburnians would say it's one tenet that has lost its disciples – and its discipline. But is the service in Melbourne really so bad? Here at WeekendNotes, we've had the privilege of reviewing many fine establishments throughout the city that we've found to have exceptional service. For example, we discovered that Is It Café in Prahran is committed to its relaxed and welcoming atmosphere, and that Skin Deep Beauty Therapy in the CBD has earned a loyal client base through friendliness and professionalism. Linda Dalziel was impressed by the thoughtful attentiveness of the staff at The Wild Oak Restaurant and Wine Bar in Olinda, and Sam van Zweden found congenial, helpful salespeople (and a good read) at The Paperback Bookshop on Bourke St.
That said, there's little doubt that we've all run into bad service from time to time. We've dealt with grunted greetings, long queues and overwhelming fakery. We've once, twice or thrice had to send back food in restaurants where our orders have undergone mysterious transformations somewhere between the table and the kitchen. We've engaged in the tacit tipping battle with those who expect something for doing not much, and we have not been impressed. It's probably safe to say we'll never have a city-wide culture of excellent customer service, but are we at least headed in that direction? Or is Melbourne just several thousand square miles of rudeness and insincerity? To help you decide, we've put together a fun quiz that rates the standard of service you most commonly experience. For each of the scenarios below, choose the option that is closest to what you most frequently experience when under those circumstances (or similar) in Melbourne. Add up the points for each of your selected options and see the results below. 7-9 Points: Your experience of customer service in Melbourne is generally very good. It's possible that you are a celebrity, a nun, or an attractive police officer. Your leisure escapades are blessed with smiles and banter and obliging goodwill. 10-15 Points: It's a bit of a mixed bag. You're just as often exasperated by poor service as you are pleasantly surprised by great service, but you're pretty savvy about where to go and have a few favourite haunts around the city that don't let you down. 16-24 Points: You're not particularly impressed with customer service in Melbourne, and quite rightly, as your experiences leave a bit to be desired. You are an observant person with high standards and you value excellence, but often find yourself time-poor and therefore faced with the frustrating caper of quick-fix options. 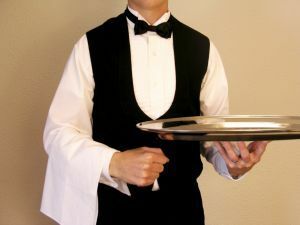 Do you have reservations about the service in Melbourne's restaurants? Do you feel like you're getting ripped off in the service department of Melbourne's stores? Does the customer service of Melbourne's taxis drive you insane? Or do you think Melbourne has customer service in the bag? Feel free to share your quiz results, your experiences as a customer and your thoughts about the service culture of our city. My local convenience store has " great " customer service. My score is 12 which is about right. I try to stay away from places where I've had really bad service, even if they're more convenient. I got 9, which doesn't surprise me. I rarely encounter poor customer service. I have to say though, I have eaten out a lot and never, ever encountered a wait person who was peeved that I didn't tip them. Oh yeah, in the US I did, but not in Melbourne. Witches in Britches just cancelled my daughters birthday party that we had booked for the 16th September. She is devastated! We booked this on the 9th of March so that we could specifically have this date and now just three weeks out you have cancelled it. I don't accept their excuse that a cast member has "family commitments". Surely they have an understudy or some other arrangement when cast members are sick or can't make it. I just think we have been treated so poorly and I am very upset. Now I have the stress of trying to find another venue and everything we have tried is of course already booked out! Thanks for nothing Witches in Britches...! Try going into Job Warehouse in Bourke St to get something - you wont get good service there! haha. For those in the know or the curiious, its actually an attraction to go and see the place. I think customer service is a 2 way street. Some of customers I have dealt with will tell you that you have no customer service when they want you to go against the company's stated rules just so they can get what they want. In that case, should we listen to them or read their reviews?